Habit: Annual, perennial herb. Stem: ascending to erect, generally clumped. Leaf: generally basal and cauline; ligule membranous, obtuse to truncate, toothed, tip ciliate or not; blade flat to inrolled. Inflorescence: panicle- to spike-like, open to compact, cylindric to narrowly conic. Spikelet: glumes +- unequal, generally <= lower floret, keeled, acute, lower 1-veined, upper 3-veined; axis stiff- to soft-hairy, generally prolonged behind upper floret, bristly or with vestigial floret; florets 2--3, bisexual, breaking above glumes and between florets (sometimes below glumes); callus short-hairy; lemma +- keeled, tip 2-bristled or not, awned on back near tip or not, awn straight or wavy to bent; palea = or < lemma; ovary glabrous or with short, stiff hairs at tip. Species In Genus: 70--75 species: worldwide (except Africa) temperate, subarctic, alpine. Etymology: (Latin: 3 bristles, from its 3-awned lemma) Note: Some species intergrade; needs study in western North America. Trisetum flavescens (L.) P. Beauv. extirpated, last collected in California 1917. Habit: Perennial herb. Stem: 0.5--4 dm, densely clumped. Leaf: mostly basal, tufted, glabrous or densely soft-hairy; ligule 1--3 mm; cauline blade generally 1--4 mm wide. Inflorescence: spike-like, 2.5--7(10) cm, dense, cylindric to narrowly elliptic in outline; lower branches erect, +- appressed; axis hairy, hidden by spikelets. Spikelet: on branches from base to tip, purple-tinged (including awns); glumes lanceolate, acute, lower 2--4 mm, upper 4--5 mm; lemma 2--3 mm, awn 4--8 mm, often bent near base. Chromosomes: 2n=14,28,42. Ecology: Dry to moist sites, meadows, streambanks, rock outcrops, open areas in conifer forest, sagebrush scrub; Elevation: 1370--3900 m. Bioregional Distribution: KR, CaRH, SNH, SnGb, SnBr, SnJt, Wrn, n SNE, W&I; Distribution Outside California: worldwide (except Africa), temperate. Flowering Time: Jul--Aug Note: Highly variable, with much ecological variation; many infraspecific taxa described, not universally accepted. 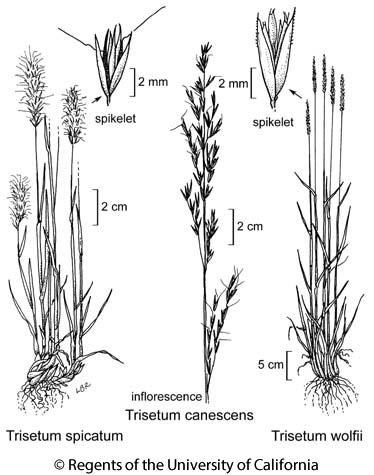 Citation for this treatment: Robert E. Preston & Dieter H. Wilken 2012, Trisetum spicatum, in Jepson Flora Project (eds.) Jepson eFlora, http://ucjeps.berkeley.edu/eflora/eflora_display.php?tid=47338, accessed on April 19, 2019. KR, CaRH, SNH, SnGb, SnBr, SnJt, Wrn, n SNE, W&I; Markers link to CCH specimen records. Yellow markers indicate records that may provide evidence for eFlora range revision or may have georeferencing or identification issues. Purple markers indicate specimens collected from a garden, greenhouse, or other non-wild location.